Pan-frying You can choose to fry your fish as is or cover it in flour or breadcrumbs. Using the extra coating will give your fish more texture and body. If you’re going to dip it in flour, soak the fish in a bowl of milk for 3 to 5 minutes, before covering it in flour or breadcrumbs. This will help the coating stick to the fish. 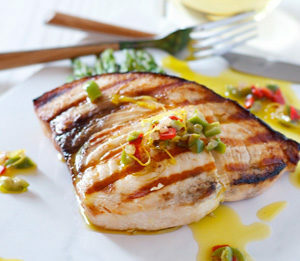 Grilling Grilling fish gives you a great advantage as you have complete control over the temperature. Always coat your fish with oil or fat to prevent sticking. As you’re heating your grill, cover the grate loosely with aluminium foil. The intense heat will cause any residue to dissolve, starting the cleaning process for you. This also minimizes sticking. Blast the heat to 288°C. Remove the aluminium foil. Using a grill brush, scrape the grate clean. Fold a few sheets of paper towels into a small pad, dip them in oil using tongs and rub over the bars of the grate until it looks glossy. Choose fillets that are thick and sturdy for grilling and can stand up to the intense heat of a live fire. Cut your fish into portions that have an even thickness to ensure you don’t have any dry or undercooked parts. 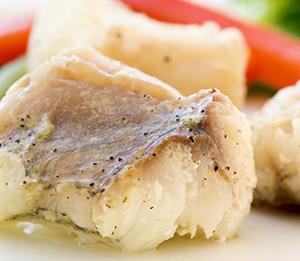 Coat your fish with some olive oil, salt and pepper and place it skin-side down and diagonally on the grill. This makes it easier to flip the fish as it’s lying on an angle. The fish will take 8 minutes to cook through per inch of thickness, taking about 3-5 minutes per side. Reduce the heat to medium, cover the grill and let it cook. When cooked properly, the meat will be firm to the touch, flake easily with a fork and appear opaque all the way through. *Recipe provided courtesy of Fairlady magazine. Cook for 15 - 20 minutes (depending on the thickness of the flesh) in closed tin foil at 180°C. and then open the tin foil and grill the bacon for a few minutes until crispy. Pan-frying You can choose to fry your fish as is or cover it in flour or breadcrumbs. Using the extra coating will give your fish more texture and body. If you’re going to dip it in flour, soak the fish in a bowl of milk for 3 to 5 minutes, before covering it in flour or breadcrumbs. This will help the coating stick to the fish. Get your pan ready for frying by pouring a few tablespoons of vegetable oil into it. You can also use clarified butter which will taste great on the fish. Heat the pan until the oil slides around easily. You can splatter a few drops of water in the pan – if the water sizzles, it’s ready for your fish. Place the fish flesh side down in the pan – the side you’ll be presenting to your diner (the non-skin side). Heat a glug of oil in a pan and fry fish. Skin-side down, until crispy. Turn fillets over and fry until just cooked. Remove from pan and set aside. Melt butter in the same pan and fry capers until crispy. Pan fry defrosted salmon in a very hot skillet brushed with a little olive oil for 2 - 3 minutes on each side for medium rare and a few more minutes for well done. Steaming is a great cooking method for calorie counters. Steamed fish must be fresh. To ensure your fish doesn’t stick, pour a little cooking oil on a wad of paper towels and wipe the surface of your steamer. Alternatively, you can wrap your fish in foil or even leaves such as spinach or Savoy cabbage. Most recipes require water for a clean, quick steam or you can use a flavoured liquid to infuse the fish with some fragrance, turning the steaming liquid into a sauce. 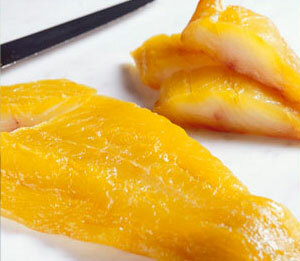 For quick and easy steamed fillets, it’s recommended to use 8 minutes for 200g medium-thick fillets. You can also calculate the cooking time at 10 minutes per inch of thickness. The steaming should finish when the fish turns opaque but is still resisting flaking as it will continue cooking when removed from the heat. Serve straight away with prepared vegetables and sauces. A good test with whole-steamed fish is to poke a skewer deep into the centre of the fish and leave for 10 seconds. Then pull it out and press it against your hand – it should feel hot. Baking fish in the oven enables you to control the cooking temperature and limit how much you handle the fish, preventing it from overcooking or falling apart. Season fillets with pepper, dip in egg and coat in bread crumbs. Preheat the oven to 275°C and line a baking tray (glass or metal) with aluminium foil. Brush with olive oil. Preheat oven to 130°C. Whisk eggs with 3/4 teaspoon salt and 1/2 teaspoon pepper in shallow dish. Place breadcrumbs on another plate. Dredge fish in flour; shake off excess. Dip fish into seasoned eggs, then coat completely with breadcrumbs. Add 2 fillets and cook until coating is golden brown and fillets are opaque in centre, about 3 minutes per side. Using 2 spatulas, transfer to rimmed baking sheet; keep warm in oven. Poaching is an easy way to cook fish quickly. First rinse the fish and pat dry with paper towels. Place the fish in a large saucepan and add enough poaching liquid to the pan to cover the fish. The simplest is to use water as your liquid and add a little lemon juice, garlic, onions, herbs and spices. You can also use some dry white wine, vinegar, broth and milk. Bring the poaching liquid to a simmer over medium heat and cook the fish for 10 minutes or until the center of the fish seems opaque and it flakes easily when poked by a fork. It’s important not to bring the fish to a rolling boil – keep it at a simmer. When the fish is done, remove it from the liquid with a spatula. 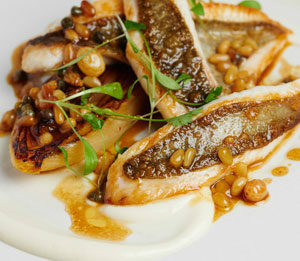 Serve the fish hot, out of the poaching liquid with a sauce of your choice. 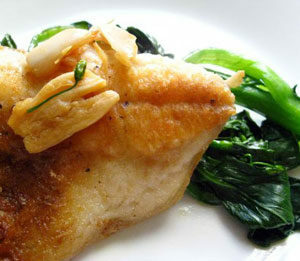 Bake at 180°C for approximately 25 - 30 minutes (depending on the size of the fish) and turn once during cooking time. This has a similar effect to steaming, sealing moisture within the foil rather than letting it escape into the oven. This method ensures that your fish doesn’t dry out and helps to seal in the aroma and flavour. Preheat the oven to 200°C and grease a large piece of foil with butter. Take your fish and season it with salt and pepper. 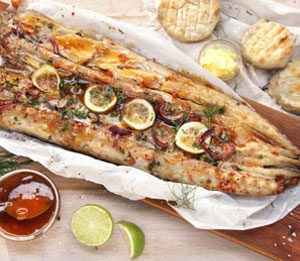 Place the fish onto the foil, add some herbs and lemon juice, fold the sides and seal at the top. Place into a pre-heated oven and cook for a specified time until the flesh is white and firm. If you’re baking a whole fish in foil, ensure that the fish is properly cleaned, scaled and gutted before wrapping it in foil. Cooking a whole fish in foil will take much longer, perhaps around 40 – 50 minutes. Preheat the oven to 220 ºC. Season the olive oil generously with salt and pepper and use to brush the fish (cleaned and gutted and head and tail reserved) inside and out. Pour the other quantity of olive oil into an oven pan, add the garlic and bake for 5 minutes. Remove from the oven and place the fish on top of the garlic in the pan. Arrange the fish on a large serving platter and surround with the roasted garlic cloves and cherry tomatoes. Finish with fresh sprigs of herbs and lemon quarters. Serve with freshly baked Italian bread spread with garlic paste squeezed from the roasted garlic cloves. Wash and peel the cucumber, slice it in half, take out the seeds and cut into .5 centimeter slices. Layer the cucumber slices in a casserole dish. Slice the octopus to approximately the same thickness as the cucumber, and layer it on top of the cucumber slices. Thinly slice the onion and Serrano chillies, and add them to the dish. Prepare a dressing by combining the lime juice, a few drops each of Worcestershire sauce and soy sauce, black pepper, and chili powder. Pour the dressing onto the layered ingredients in a casserole dish. Mix the squid with the lemon juice in a bowl, ensuring the squid is thoroughly coated. Set aside to marinate for 30 minutes. Heat the barbecue or a grill (broiler) to its highest setting and cook the squid, reserving its marinade, for about 3 minutes on each side. Meanwhile, melt the butter in a wide pan and add the squid marinade and parsley. Bring to a simmer and season with salt and pepper. 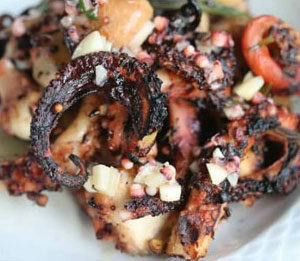 Pour the sauce over the squid and serve immediately. If you’re opting for deep-frying your fish, the most important part is breading the fish. 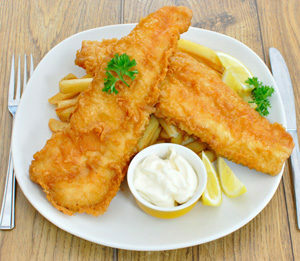 You can bread your fish in flour, cornmeal and seasoning mixture and adjust the seasonings according to your taste. For starters, heat your oil in a deep fryer to 375°C. In a shallow bowl, combine cornmeal, 1 cup of flour, salt, black pepper, garlic powder, paprika, parsley flakes, dried oregano and cayenne pepper (if you like a spicier taste). Add salt to the hake roe, add white pepper, and oil and mix together. Wrap each roe in foil. Roe's are often in two parts, one part to one piece of foil is best. Grill the foil parcels on the barbecue for 5 minutes, if you don't have a barbecue ready, you can also dry fry it in the tin foil. Flatten a lump of sticky rice in your hands, place a roe in the middle, and wrap the sticky rice around it - it's as simple as that. Start by heating olive oil in a large pot. Add garlic and cook for a minute, then stir in tomato and cook for 2 more minutes. 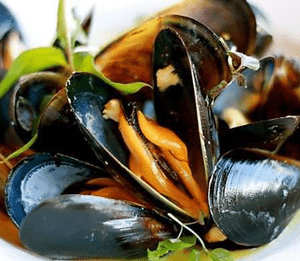 Add mussels (discard any open ones) and wine. Cover and cook until the mussels open (discard any that don't), about 5 minutes. 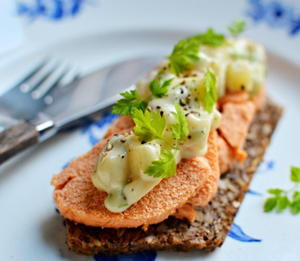 Toss with chopped parsley and serve with crusty bread.